January 8, 1935 twins were born to Vernon Elvis Presley and Gladys Love (Smith) Presley. One died (sadly) and one lived. The child that lived was given the name `Elvis Aron Presley` and it was (on January 8, 2010) seventy-five years ago on this day that blessed event took place. I could write novels about Elvis` accomplishments, struggles, frustrations, etc. but I believe that on this day we should honor the man, support the loved ones who miss him greatly, and convey our hopes/thoughts that his name will live on and others will learn from his actions (i.e. his charitable ways, his faith in God, loyalty, etc.) and most of all realize that in America a person can rise up from poverty and become a beloved icon and thereby support his family/friends doing what they love and using the gifts that God bestowed upon them. I also should say THANK YOU to Jack Soden, Priscilla, Lisa Marie, and to the Memphis Mafia (i.e. Marty Lacker, Red West, Sonny West, Billy Smith, Lamar Fike) and to Joe Esposito and Jerry Schilling. Each of you carry within your heart a piece of Elvis and through you we learn, and have learned, so much about the man onstage`and off. Also, I must say a THANK YOU for keeping certain things out of the public domain as your silence is yet further proof of your love for him and the honor you shared. 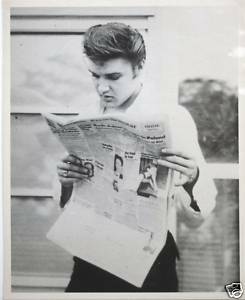 To Elvis Fans Worldwide I can only say after (approximately) FIFTY YEARS of (thousands if not millions of hours) reading, listening to, collecting, etc. anything/everything about Elvis Presley that I learn new aspects about him yearly and his music, and his stage presence, remain the utmost in excitement`and vocal/stage presence ability. There will never be another one like him and for good reason. Elvis used to `question` WHY God had chosen him. I cannot say for sure for I would never guess God`s actions/inactions. But I can surmise that perhaps the reason was that Elvis had a good heart and that being his greatest strength was also his weakness. Besides being known as `crazy eyes` his presence was `felt` by all and his mood could dictate others emotions. I believe that when someone truly cares about mankind in general, and people in need specifically, that they carry with them a burden that never ceases like a thirst that never can be quenched. It is my belief that Elvis is in Heaven and I hope that he is there with Gladys, Vernon, Dodger, Jesse, Charlie Hodge, and so many others who loved him`and he loved. It is my hope that those who remain on this Earth will continue to share their stories AND be afforded the respect, appreciation, and acknowledgement that they have earned. It is my prayer that God will give us all the strength to go forth and to openly use the abilities that God has given us and if we do some will achieve Worldwide fame, others will help the needy, some will become parents, others will cure disease, and more often than not they will be there working diligently to make this World a better place. The World lost a great man on August 16, 1977, for all of his shortcomings, but today is a day of remembrance so as loud as I can (and I hope that this expression is carried on throughout the `World Wide Web`) I say `HAPPY 75th BIRTHDAY ELVIS ARON PRESLEY`!